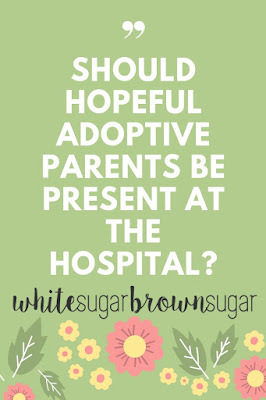 White Sugar, Brown Sugar: Should the Hopeful Adoptive Parents Be Present at the Hospital? 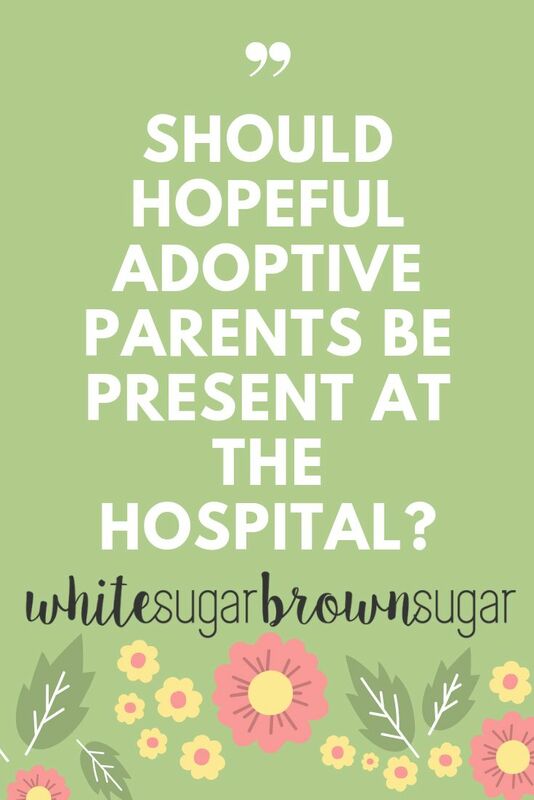 Should the Hopeful Adoptive Parents Be Present at the Hospital? I mean, this is a big question. One that is controversial in the adoption community. I've avoided tackling this for awhile, if I'm being honest. But I think the time has come. Time, distance, and experience have given me the courage to write this post. So, here goes. 1: I'd never experienced it. 2: I was scared of the experience. 3: I felt the hospital had the potential to be unethical. But this ALL changed when not only was I invited to be in the delivery room, but it was INSISTED that I be there. Not by a social worker, not by an adoption agency, not by a lawyer, but by an expectant mother who wanted support. Terrified of my own emotions. Terrified of all the unknowns. Terrified that I'd do something unethical. Terrified that I'd fall even more deeply in love with a baby who I couldn't call MY child and with a mama who, no matter what her decision, would leave the hospital with a broken heart. You see, deep down I knew: this baby wasn't mine, the expectant mom wasn't "our" "birth" mom, the pregnancy and delivery weren't mine either. NOTHING was mine. Everything was hers. And I don't say that out of selfishness, bitterness, anger, or confusion. I'm sharing it out of acknowledgement. I believe all hopeful adoptive mamas need to, first and foremost, know exactly what a match is and isn't and do whatever it takes to have an ethical adoption. Because as I say, time and time and time again, if and until TPR and revocation is over, the parents have every right to parent their child, and there is no promise of placement with the adoptive family. Nor should there be. And, I really, really wanted to protect my own heart and the hearts of my spouse and the children we were already parenting. There were SO many hearts on the line. You see, thus far, we had chosen to have ethical adoptions. Doing the hardest things that were the right things. The right things, in the right ways, every time. To us, there was no question of whether or not we'd have an ethical adoption. It was an ethical adoption or NO adoption. PERIOD. So why did I agree to be in the delivery room? Because I made peace with the invitation to be there. I knew it was not suggested to the expectant mom. I knew not a soul had told her to do it and listed reasons why. It was her own, free choice. And I knew if I said no, she would be in that room alone. And we had spent months getting to know one another, and I was ultimately (honestly) invested in her. I wanted her to feel that she could do whatever she decided, whether that meant parenting or placing. And I made this very, very clear. "No matter what you decide, we support you. We would be honored to be this baby's parents. But we also respect your decision to parent this baby." This sacred conversation happened many times. I offered this affirmation more times than I could count, as I wanted it to be perfectly clear. And I promise, I meant every single word. I did. Yes, it was hard at times to imagine leaving the hospital without the baby. Of course, it would be difficult. But if it were the choice made, we would support it. I think the choice to be in the delivery room was OK for me for a few reasons. And these are personal, and certainly cannot be "one size fits all." 1: We had a lot of adoption experience. 2: We had friends from all three points of the triad (adoptive parents, birth parents, adoptees): and had listened to their thoughts and experiences for many years. 3: We examined the invitation, at lengths, and then said yes, aware that there was no unethical actions or words behind it. 4: We didn't initiate or expect the invitation. We didn't eagerly and naively accept it either (point #3). 5: We felt no person should bring a baby into the world alone. 6: We understood and articulated, many times, that if the child wasn't to become "our baby," we would support that choice. In the end, I am so thankful I was there. Those moments were sacred, beautiful, hard. I'm thankful the photos we took and shared with each other. I'm thankful for hands-in-hands and words of encouragement. I'm thankful for the beauty in the brokenness. And yes, we remained ethical. And I can tell my child, I had the courage and faith to say yes, even when I was terrified to do so. So if you, dear one, are considering the hospital experience, may I shed some wisdom on you, now having been there? 1: Do not demand or expect the invitation. It's not your baby, it's not "your" "birth" mom, it's not your birth. None of it is yours. 2: Know that a match or hospital experience doesn't mean you will be placed with that child. There are no promises or guarantees. Don't try to figure out the likelihood a mom will parent or place. Let it be. 3: Let all decisions be made by mom, if and until you are mom. If the hospital staff defers to you for decisions, you need to point them right back to mom. 4: Ask to take pictures. But don't be disrespectful about it. Ask if it's OK to take pictures, and check in on that often. Whether or not mom places or parents, you can share those photos with her. 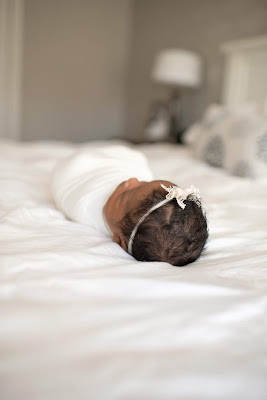 And for the love of all-things-adoption, do not post photos online of a baby who isn't yours. 5: Don't hover or assume. You ask, every single step of the way, what mom wants. Period. Don't ask questions about mom or baby, of the hospital staff or any other professional involved, that aren't your business. Don't offer over-the-top gifts, for example, attempting to manipulate the situation. Because trust me, whatever is best for the baby is what is best for all. (Save those special gifts for after placement if placement occurs. Too many parents want to give mom a matching bracelet, for example, with a birthstone in it.) Manipulation = coercion. Coercion = unethical. Unethical = not good for anyone. 8: Know the laws and policies. What are the TPR and revocation laws? Don't forget about the child's father, who also has rights. And know the hospital policies so you don't overstep. It's best to have a reputable adoption attorney involved, and to be ethical, the birth/expectant couple, the hopeful adoptive family, and the child should each have separate legal representation. 9: Be proactive without being pushy. I think it's fine to ask the mom you are matched with, what do you think your hospital experience will look like? What can we do to support you during that time? And no matter what, be supportive of her decision and understand you may not be privy to her hospital plans. 10: Don't insist on breastfeeding or doing skin-to-skin at the hospital. Is the current "plan" or invitations working OK? Be clear that you are fine to go elsewhere, leave completely, take a break, etc. Don't make it about you. Because it's not about you. 12: Don't show up with your own posse. The hospital experience is not the time for all the grandparents, siblings, cousins, aunts, uncles, etc. to meet the baby. This is manipulative: no matter if you intend for it to be or not. If you're invited to bring someone to the hospital to meet the baby, consider this decision very carefully. 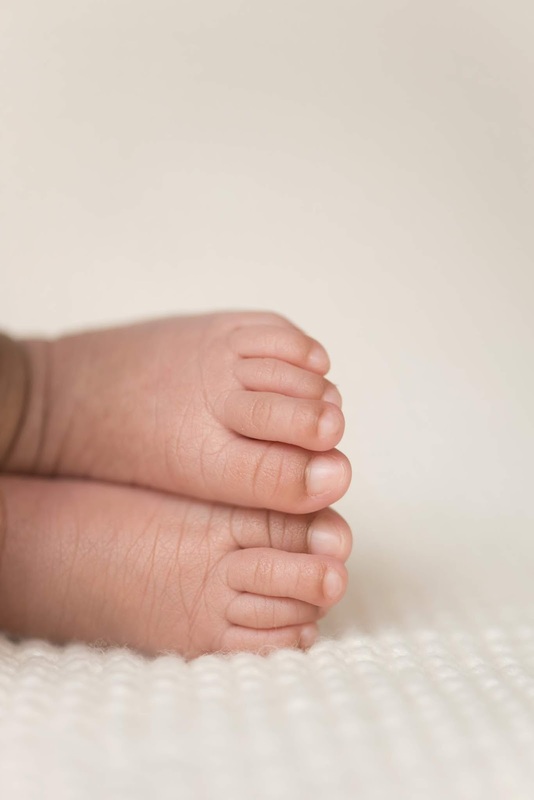 The #1 argument I encounter against hopeful adoptive parents being at the hospital is that there is simply no way their presence can be ethical. It's often assumed that the mom was coerced into allowing the hopeful parents to be present. There is no way, arguably, that hopeful parents can be unbiased in every way, all the time, and their very bodies being there is a form of manipulation. Yes, there is so much on the line. And yes, it is VERY hard to be present AND be ethical. Because at the very heart of the storm is a child and a very big decision for a mama to make. But I do not think there is a one-size-fits all approach to the hospital decision. I don't think it's up to anyone else to judge a mama's decision to invite parents to the hospital: IF she is making that choice by her own free will. Her reasons are personal, private, and sacred. And ultimately, should always be respected by all parties.